What is better than cake or brownies? Cake AND brownies!! Try this delicious layered cherry chocolate dessert to enjoy the best of both worlds! Heat oven to 350 degrees F and spray a 13 x 9 cake pan with non-stick cooking spray that is lined over the sides with parchment paper. Cream the butter with sugar until light and fluffy. Mix in the almond extract and cherry extract and beat well. Sift in the cocoa and mix until combined. In separate bowl, sift together the cake flour, baking soda and salt. Add flour mixture to the butter mixture and mix until just combined. Stir in the cherry pie filling. Pour the batter into the prepared pan. Bake at above temperature for 30-35 minutes or until a toothpick inserted near the middle comes out clean. Let cool for 10 minutes on a wire rack. Bring cream to simmer in medium sauce pan. Remove from heat; whisk in the chocolates, jam and juice until chocolate is melted and mixture is smooth. Warm the cream in a large saucepan to simmer and add the jam and cherry juice. Whisk in all chocolate until mixture is smooth. Pour this over cakes and brownie. 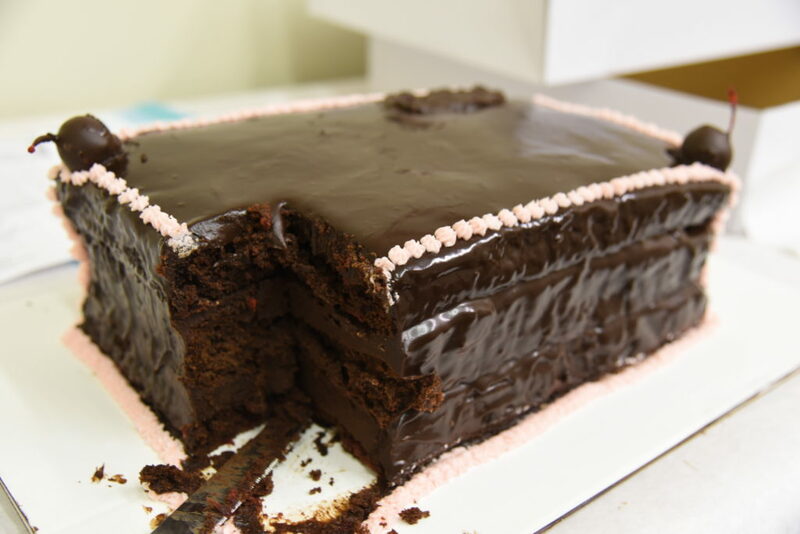 Make sure the top and sides of large cake are all covered with the ganache. Chill for 2 hours until ganache is set. Apply cherry frosting using a star tip in a piping bag. In a large bowl, whip the shortening until is is light and fluffy. Gradually sift in the powdered sugar 1 cup at a time along with 1 T. of the wet ingredients. Beat after each addition. Stop using wet ingredients when frosting has reach your desired consistency. Remove the cakes and brownies from their pans and peel off the parchment paper. Place cake with fudge layer on top of wax paper. Stack the brownies (un-cut) on top of this cake. Follow this with the cake on top that does not have a fudge layer on it. Carefully apply ganache to the stacked cake and brownie layers. Garnish with the 4 chocolate-covered cherries from Fair Oaks Farms at the corners of the top of the cake.